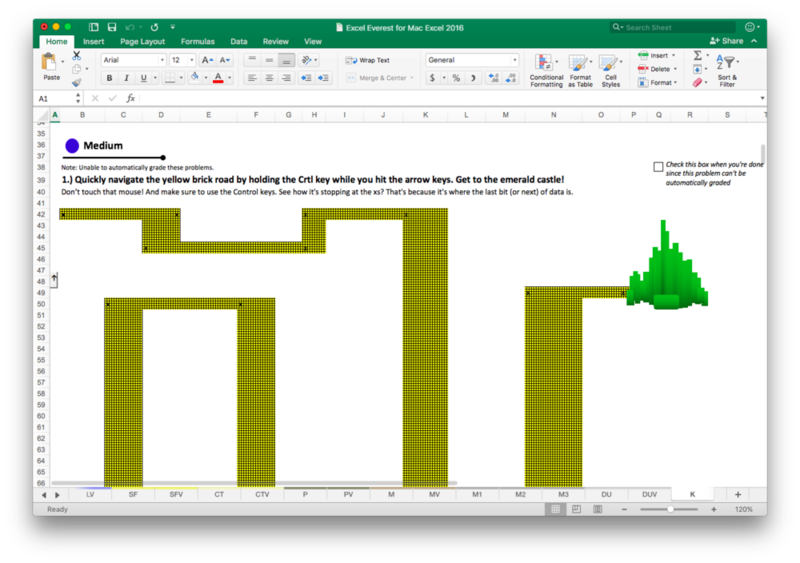 Get ready to master Excel for PC (compatible with Excel 2003, 2007, 2010, 2013, and 2016+). Why pay $400+ for a course when you can learn interactively with us? Get ready to master Excel for Mac (compatible with Excel 2011 and 2016+). Why pay $400+ for a course when you can learn interactively with us? You need a comprehensive Excel training that covers all the essential business Excel skills, and with unlimited access and upgrades. You realize that the best way to learn a complicated program like Excel is not by watching videos, but by going through exercises right there in an Excel document. You're not ready to spend $400+ on live Excel courses. You'd like to use the same Excel training for your organization that companies like Google and Eventbrite use for their employees. You'd benefit from accountability and a way to measure your progress against clear goals. A deep understanding of all of the business critical aspects of Excel. Colleagues will be leaning on you for advice on VLookups and Pivot Tables. The ability to quickly run analyses and interpret data in your day-to-day job and personal life. 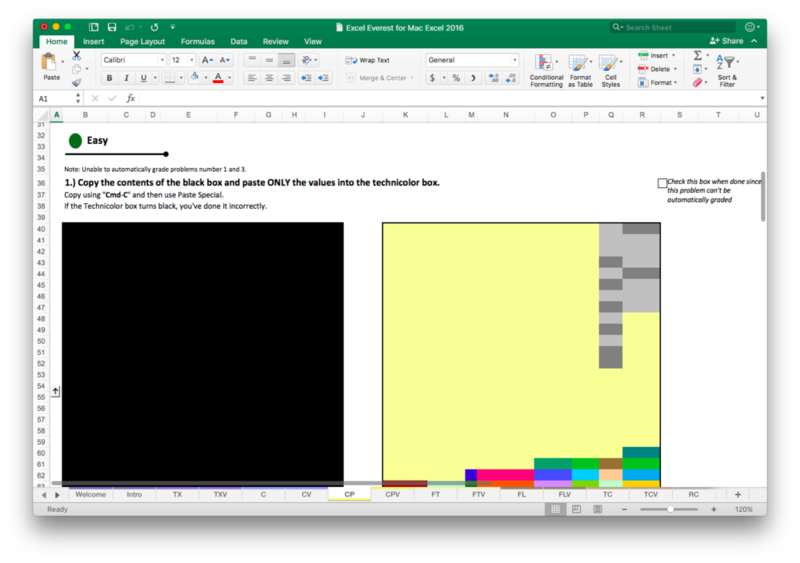 A keen sense for the biggest, most critical mistakes and errors people make in Excel and how to avoid them. Basic data visualization and furthered knowledge on how to make charts and graphs that tell stories. If you don't find value in Excel Everest, just tell us within 90 days and we'll completely refund your purchase, no questions asked. All we'd hope for is a little feedback so we grow and learn. 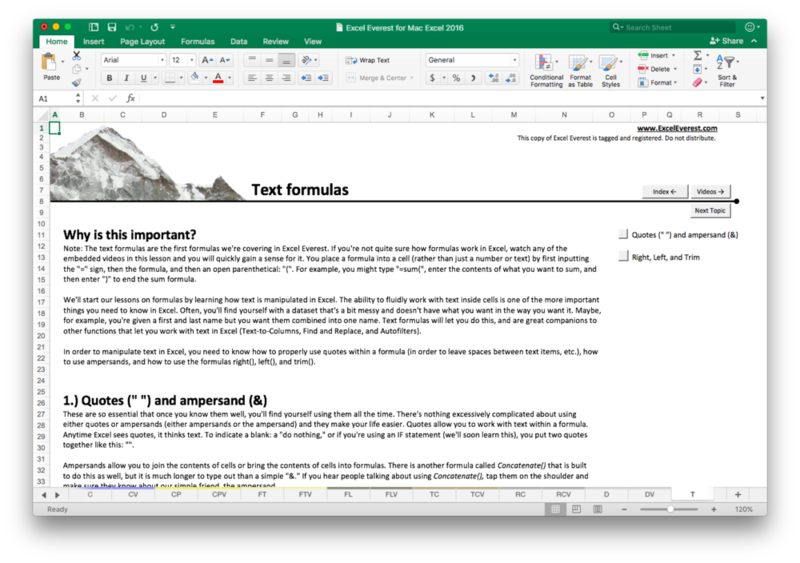 Excel Everest is a massive interactive training course. Here's a peek at what you'll find inside. 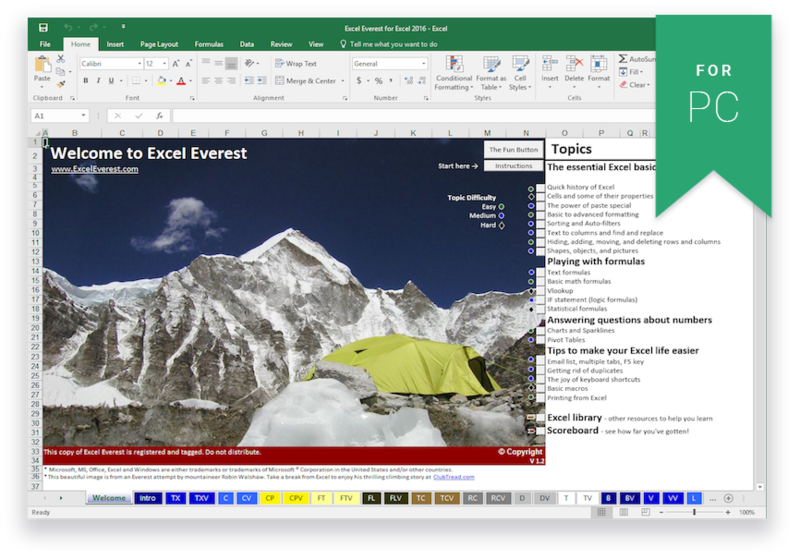 Excel Everest has 41 key business topics and over 150 interactive exercises. All are organized logically and simply in the order you should learn them. You'll go through hundreds of fun, interactive exercises so you learn by doing versus watching videos. Learn how Excel came to be one of the most powerful pieces of software the world has created. Sure, we teach you how to use critical Excel functionality, but we always make sure to share why it's critical to your career. Excel Everest exercises solve problems that you'll find problems in your day-to-day career. Start using your new skills from Day 1. There's a scoreboard in Excel Everest so you'll know exactly how you're doing at each step of the journey. We not only focus on helping you learn the key concepts, we help you become quicker and more efficient. “MY INTERNSHIP SENT ME TO A TRAINING BUT I DIDN'T REMEMBER ANYTHING. I LEARN BY DOING. A FEW HOURS IN EXCEL EVEREST AND I FELT I HAD SKILLS FOR LIFE."